What did I have for lunch today? Why, salad, of course, silly! But, since I actually have a serious aversion to the word "salad", I had to make this one be, like others in the past, much more than some big pieces of iceberg lettuce and a tomato on top. I added color, flavor, and a smidgen of pomegranate salad dressing to my romaine lettuce. Figs, mushrooms, cashews, oh my! 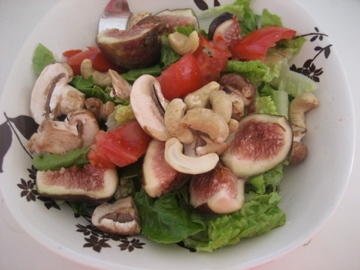 I love figs in salad!